There are wonderful resource materials available for teaching knitting and crocheting to kids and teens. Consider building a reference/lending library for your group with how to books, videos and DVDs featuring instructions, illustrations, and fun project patterns. Check out the following resources. Many are specifically geared to kids and teens or feature projects with great youth appeal. In addition, the web sites of the following companies feature many projects with terrific "kid-appeal." This helpful guide for teachers and handbook for students has all the information anyone needs to create an entertaining and educational class for children between ages 7 and 14. Plus, both booklets include fun projects. All you have to possess is knowledge of some basic crochet or knitting skills. This fun DVD provides three ways to learn: Dr. Elizabeth Seward entertains kids with a unique, animated story while teaching them to knit and make their own knitting needles. Kids teaching kids—every kid will be inspired watching 7 year old Ryan Anderson as he teaches the basics of knitting. Knitting instructor and producer Marcy Levitas Hamilton teaches the kids how to make fun and easy knitted balls and toys with Stitch-Along instructions. There's also a visit to The Alpaca Ranch to learn how yarn is made. Right- or left-handed, you can learn to crochet and knit with these longtime bestselling books. They feature large, clear, how-to-stitch photos shown both ways. The books are chock-full of time-tested fundamentals that beginners and experienced crocheters or knitters all will find useful. 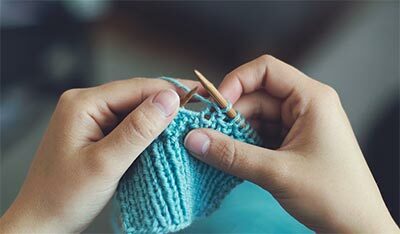 Inspired by Leisure Arts' best-selling book, the I Can't Believe I'm Knitting and I Can't Believe I'm Crocheting DVDs make it easier than ever to learn. Designer Melissa Leapman provides friendly, expert guidance through the step-by-step lessons. Projects are included along with a convenient A-to-Z Index, Reference Library, Trouble-shooting Guide, and other features. These booklets feature bright colors, fun photography, and step-by-step instructions to help children ages 9 to 14 learn to crochet and knit, along with cool projects, and much more! With only two stitches to learn and "shoulder-to-shoulder" instruction from Chelsea Povall, this DVD will have teens knitting their first project tonight. Each step is shown up-close and in motion. There are loads of beginner projects to make: iPod case; wrist, ear, and leg warmers; messenger bag; cushy rug; cuddly throw; so-cute doggy coat; scarves; bracelet and matching ring; lip balm holder; hats; and more! An A-to-Z index makes it easy to quickly find the info you want. Also watch the Teen Knit Cafe gang custom dye yarn with Kool-Aid®, make knitting needle toppers from clay, and try the hot new trend of needle felting! Run time: 98 minutes. In addition to the following resources, Coats and Clark offers educational materials and discounts to classroom teachers. For more information call (800) 648-1479 or write Coats & Clark, P.O. Box 12229, Greenville, SC 29612. Geared to the younger set, this booklet includes projects for different levels of beginners--pillows, bags, finger puppets, sweaters, and more. This booklet combines easy knit and crochet patterns with teen appeal, including hand warmer/scarf/hat, knit crop top pullover, a teddy bear, bags, and more. 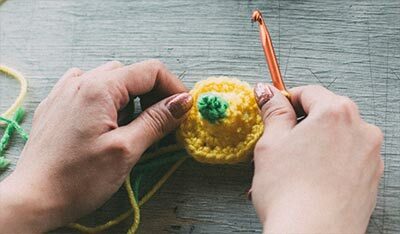 More knit and crochet projects that have special appeal for teens, including simple slippers, mittens and even a cute crocheted dog sweater. This booklet includes both knit and crochet projects that are quick to do. Stripe it up! (J17 Book 0743) - This leaflet features quick projects to knit and crochet with teen appeal (pillows, tote bag and knit and crochet pullovers). This delightful book is really two books in one and the readers (ages 8-12) learn to knit with Mary Ruth. Knitting to the Rescue! is a storybook about Mary Ruth and her brother Jacob learning to knit from their grandma during a blackout. 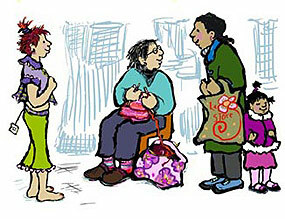 In Mary Ruth's How to Knit Book, Mary Ruth presents her step-by step instruction book for kids learning how to knit! This beginner-friendly handbook targets the new face of knitting and crochet: a contemporary, energized young audience that's embracing yarn and needles with a passion. It's cool, it's chic, and includes how-tos, resource guides, tool lists, and easy-to-follow instructions, as well as skill-building projects. These are the perfect primers for hip, young knitters and crocheters. Both books offer a self-contained curriculum and takes you step by step through the process of learning either knitting or crochet by incorporating new techniques and tips into stylish scarves, hats, sweaters and accessories that are as fun to make as they are to wear. This collection of Barbie fashion books by designer Nicky Epstein would win over any little girl's heart. While many of the projects are too sophisticated for beginner knitters and crocheters, they are inspiring and offer designs that can be crafted by all skill levels and enjoyed by Barbie lovers of all ages. If you have fond memories of spool knitting (a round wooden spool with a central hole surrounded by four small nails) when you were a child, then you know how easy it was to create yards and yards of knitted tubes. Today, there are looms that come in a variety of shapes and sizes, some are circular, others rectangular, some tiny and some large. The size of the loom dictates the size of the knitted piece although you can easily join smaller panels together to make larger items. The Primer contains clear step-by-step illustrations throughout with practice projects, as well as variety of projects; the Pattern Book contains numerous project ideas that appeal to kids, teens and adult alike. Targeted at young people, the book features 25 simple projects that are easy to follow but EVEN more importantly worth making! The heart of the book is the super cool, super fashionable projects- from a loopy muff to a flower corsage to a feather-weight silk evening scarf to easy projects to give as presents, like a laptop case or a guy's scarf. Amigurumi is the Japanese art of making knitted or crocheted stuffed animals. These toys can be as simple or as complex as the maker likes--ranging from a tiny fluffy chick to an elaborate textured elephant, which should interest kids and teens alike. This book provides all the information you need to get started, with tips on choosing yarns and needles, and instruction in core techniques. Also visit these web sites for helpful project ideas, books and products.